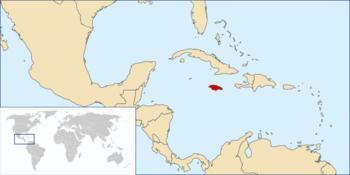 1 Jamaica is an island in the Caribbean Sea. Perhaps you have visited this place. Vacationers love the beaches with their beautiful white sand. In fact, the name Jamaica comes from the Native American term Xaymaca, which means "land of wood and water." Around 2.8 million people live on the island, and nearly 2 million people visit there each year. Once you travel away from the vacation spots, though, Jamaica can seem like a completely different world. 2 Eduardo was one of the lucky people. He grew up very poor near Kingston, the capital city of Jamaica. With help from his family, Eduardo stayed in school and stayed away from the gangs in the cities. He grew up and took a great job in the Montego Bay area. The hotel he manages keeps him busy all year. He makes enough money to support his family. 3 Eduardo knows the life he could have had. Many of his friends still live that way. The unemployment rate, or the number of people who can't find work, is very high in Jamaica. Even those who find work may only find it by the season, such as from December through April, working where the tourists stay, or during the season where work on sugar plantations can be found. 1. Tourism is a big part of the economy in Jamaica. Create a travel brochure for an imaginary hotel there. 2. Research government alerts about safe/unsafe parts of Jamaica. 3. Research gangs. What are some general statements you can make about gangs?